Tendonitis treated at Solihull Sports Injury Clinic West Midlands. Tendonitis is inflammation of the tendon which is often a result of overuse, overloading or overstretching of the tendon. Achilles Tendonitis and Patella Tendonitis are 2 of the common lower leg problems of tendonitis you will see in a sports injury clinic. Runners and running sports often see achilles tendon inflammation which if not treated swiftly can become chronic and take more time to resolve. Patella Tendonitis is the inflammation of the patella tendon just below the kneecap often found in football and jumping sports such as babmington, squash, tennis and basketball. There are many areas affected by tendonitis and treatment involves reducing the inflammation and conditioning the muscles involved to cope with the workload that is required. Rest is often suggested to help speed up recovery during treatment and ice can reduce the pain and inflammation to a surface tendon. Shoulder pain can often be caused by a tendonitis of the rotator cuff. The supraspinatus tendon often suffers from tendonitis and is a common cause of shoulder pain. Tendonitis of the supraspinatus will generally refer pain into the upper arm and often does not hurt at the shoulder itself. Very painful if trying to put your arm behind you and women find it difficult in undoing the bra strap. 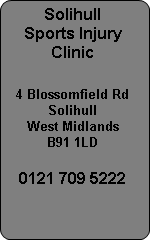 At Atlas we have a specialist shoulder clinic headed by a Solihull Shoulder Consultant. We provide consultations, diagnosis, physiotherapy, injections and surgery options for shoulder problems.